Data-Driven Design, or using Data to inform Design decisions, is a topic that has already garnered a lot of attention. An approach that is on the rise is Design for Data which implies a different causal relationship between the two in which Design, by which I mean understanding user/customer needs through research and iterating possible solutions using customer-tested prototypes, is used to transform what and how data is handled within the chosen domain. Adding human research methods and rapid, iterative, co-creative prototyping to the mix offers the ability to develop concepts that can inform data-decisions. 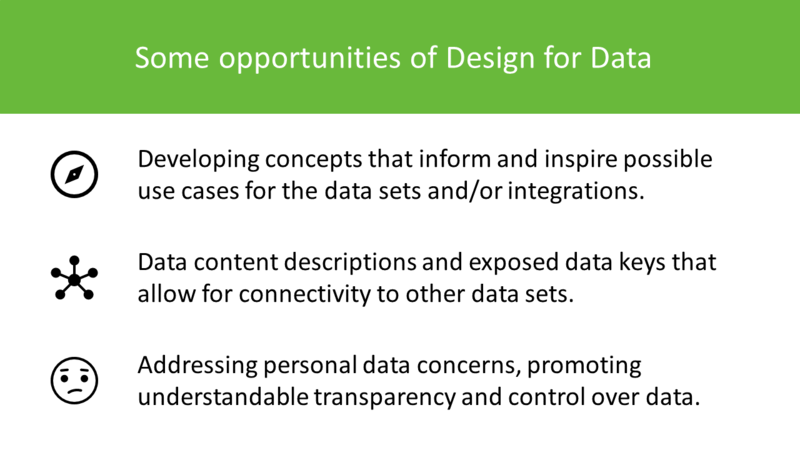 Design for Data approaches can be applied in multiple contexts: data modeling, open data initiatives, both content and Developer Experience issues related to APIs, MDM projects that seek to integrate data around human needs rather than systems, finding opportunities for applications of MyData. Once more with feeling: What is Design? Variants of Design Thinking are all the rage right now as many might have noticed. However, being a relatively new discipline to enter the development approach mix, many still equate the practice with the design of concrete objects or interfaces that have to do with the crafts and the arts. Even though look & feel are of course part of the human experience, Design Thinking variants Service Design and Systemic Design, or what I like to call Service Systems Design, incorporate also higher order elements like the service/product/offering/value proposition and the whole socio-technical system. Organizations employ Data Models on similar levels spanning from solutions (= services) to the Enterprise level where they are often used for Business Intelligence applications including their underlying Data Warehouses, opening data using APIs or other formats, integrations between existing solutions and creating new solutions. Mapping similar tables and fields between solution data models is pretty straightforward but things tend to get complicated when there are external demands for how data is handled. These demands can arise from regulatory changes and be driven by business or human needs. For example the EU GDPR requires data controllers and/or processors to enable consumers and citizens to be able to provide consent to the usage of their data, erase their data and have the right to be forgotten. The global MyData movement, which advocates the person’s right of data portability or the ability to transfer one’s data from one service to the other, is a phenomenon that might also have implications to how enterprise data should be handled. MDM initiatives especially in Europe are currently challenged with creating a capability for Personal Data Management which also require changes to consumer-/citizen-facing services to comply with regulation. In addition to developing a link between uncovered user problems/needs and solutions, Design for Data can be applied to understand ethical and trust issues as well as concerns of the people and their activities that are described by the data. Developers often start in the solution space to create whatever they seek to create. Most of the value of Design exists in exploring the problem space which is the focus of users (the need to get a problem solved or get a job done) and businesses that seek to bridge problems to new solutions. 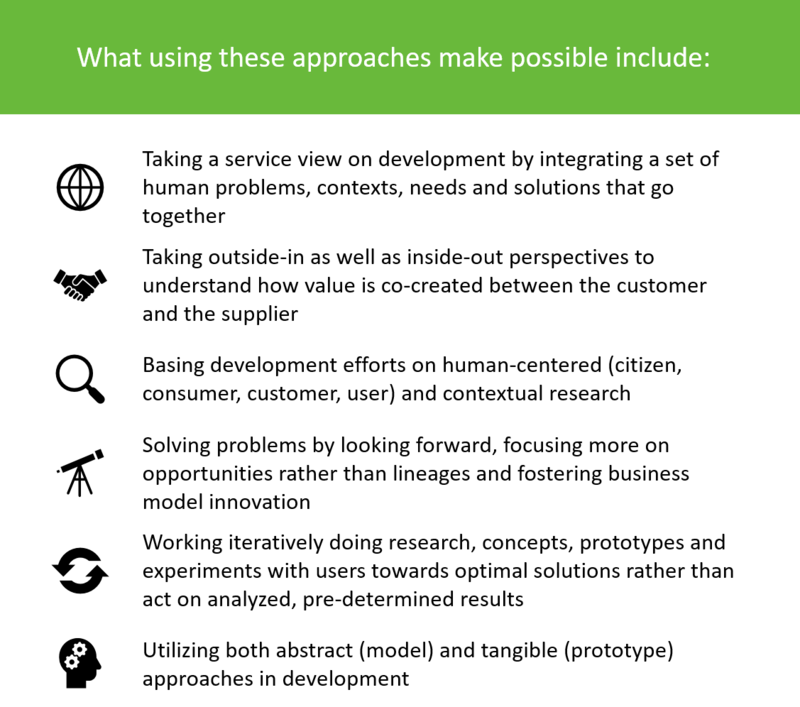 Adding Design for Data approaches and practices to data challenges offers valuable perspectives in enhancing to end-users, businesses and developers. End-users stand to benefit from an added understanding of their needs and concerns within solutions and the complex inter-organizational and interpersonal situations they face in their lives. Design is often also applied to businesses. Especially startups but increasingly also established organizations are looking to understand the problem space better to create new opportunities for innovation. If data is to be a source of revenue, it is important to understand the possibilities to both end users and digital business ecosystems in promoting multi-sided value creation. Developers use data to create solutions. However even though there is a lot of data available there is a learning curve to get acquainted with the data content and its possibilities. We could use design to shorten this learning curve and the overall developer experience. You might want to check out these recent posts by various people to learn more about opportunities related to Design for Data. Juuso Parkkinen: Data Needs Ethics!